The McCarty family finishes a tour of the Ronald McDonald House. Twenty-four hours can change a life. Over one day in September, one Hoover family changed the lives of four families who need the Ronald McDonald House. Krystal and Todd McCarty are originally from Mobile. These high school sweethearts attended college together at UAB. In Todd’s fourth year as a medical student, the couple was ready to welcome a daughter, Sara Kay, in September of 2009. Around 21 weeks, they received devastating news. Sara Kay had a condition called triploidy, which occurs when there are three of every chromosome. Sadly, it is fatal and Sara Kay passed away shortly after birth. Krystal and Todd have never forgotten Sara Kay and have made it a point to share her life, especially with their two daughters, Ava Marie, 7, and Charlotte, 5. It was a conversation with their girls last year that sparked the idea to do something in Sara Kay’s memory. After doing some research, Todd and Krystal settled on a Facebook Fundraiser to benefit children and their families in some way so they researched several charities. 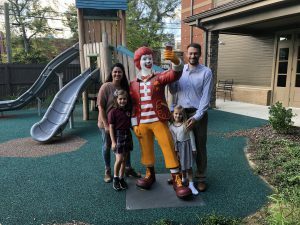 They settled on Ronald McDonald House Charities of Alabama in part because several of their neighbors volunteer with the charity and Todd ran in the annual Red Shoe Run after encouragement from one of his medical school professors. “And it easily could have been us staying at a Ronald McDonald House,” Krystal said. So they set up the Facebook Fundraiser with a goal of $2,800. Suffice to say, their friends and family blew that goal out of the water! “As it approached the $1,200 mark, Todd and I said, ‘Let’s see if we can’t get the remaining if we offered to match the next $1,000.’ Our $1,000 was matched within two or three hours,” she said. Within 24 hours, the fundraiser had topped $4,000. Their Facebook Fundraiser closed out at $5,338. In an update on the fundraiser’s page, Krystal gave a moving message to her friends and family. Krystal and Todd hope to continue this birthday tradition for Sara Kay and see how it evolves. They’ve already talked about having a gathering at their home and hosting another fundraiser or supply drive. 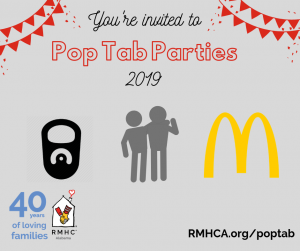 Everyone here at Ronald McDonald House Charities of Alabama is grateful for their generosity and that of their friends and family!